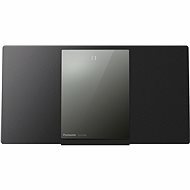 Microsystem from the popular Panasonic company in a top-quality and compact design. Enjoy re-master Bluetooth playback capabilities for perfectly-clean sound. 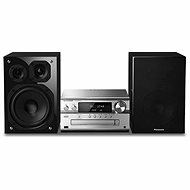 This unobtrusive, compact Panasonic system is built on the company’s many years of experience with delivering excellent sound quality, connectivity and features. The new LincsD-Amp technology and three-way speakers with a total output power of 120 W gives you rich audio from a wide variety of music sources. The main unit features aluminium panels and a compact, sleek design. The system plays compact discs, music from Apple devices and USB drives, FM radio, and also includes wireless transmission support. Thanks to its in-built streaming support, you can take advantage of the system's great speakers and play music from your computer, smartphone or tablet in perfect quality. Let loose and turn your apartment into a thrilling nightclub in just a few short moments. The microsystem supports Bluetooth wireless technology and the Panasonic Music Streaming app. The speakers have a sophisticated internal design, so you always get crystal-clear audio without any noise or distortion. High-quality materials and components guarantee long service life and exquisite acoustic properties. The latest innovative version of the LincsD-Amp technology manages to correct various issues (such as jitter and power supply noise) that usually cause distortion in digital music playback. 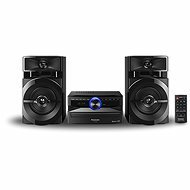 Enjoy the music with the Panasonic PMX80EG-K microsystem and experience audio so realistic you would almost believe you are listening to it live. Für Versand nach Deutschland, besuchen Sie bitte Panasonic SC-PMX80EG-S silber. Chcete doručit zboží do Česka? Prohlédněte si Panasonic SC-PMX80EG-S stříbrný. Chcete doručiť tovar na Slovensko? Prezrite si Panasonic SC-PMX80EG-S strieborný. Für Versand nach Österreich, besuchen Sie bitte Panasonic SC-PMX80EG-S silber. For shipping to the United Kingdom visit this page Panasonic SC-PMX80EG-S Silver. Magyarországra történő kiszállításért tekintse meg ezt a termékoldalt: Panasonic SC-PMX80EG-S ezüst.